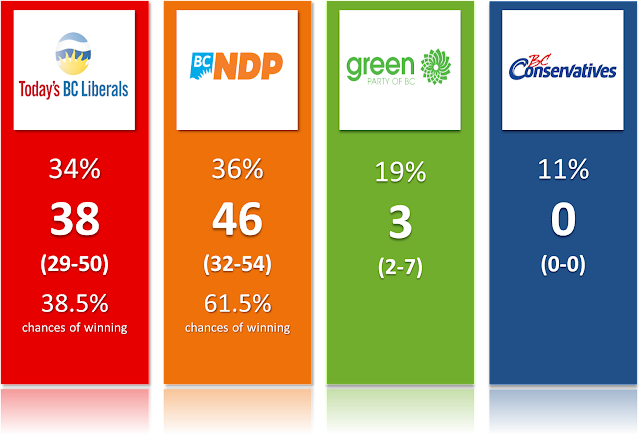 Uncategories BC poll: The Green Party continues to rise, especially on the island. 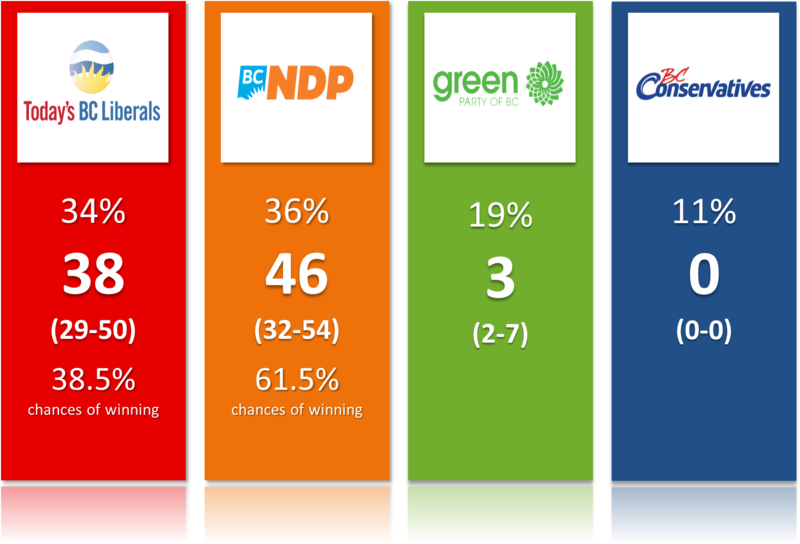 BC poll: The Green Party continues to rise, especially on the island. The latest BC poll by Mainstreet shows the BC Green party continuing its progression, now reaching 19% (among decided and leaning) and even being tied for first place (at 32%) on Vancouver Island. While these numbers are not that different from last week's ones (respectively 17% and 25%; so no significant change given the sample size), it is still newsworthy. We are less than 2 months away from the election and the BC Green seems quite strong. Will it last during the campaign or will it decrease like last time? Hard to tell, especially since only 35% of the Green voters say their choice is strong (i.e: won't change their mind), much lower than the BC LIberals voters (73%) and BC NDP ones (64%). The BC Green is technically only projected to win 3 seats, but this is only half the story. First of all, the simulations show an absolute max at 13 seats. More realistically, the party of Andrew Weaver appears competitive in 7 ridings, all on the island. Also, the current projections might well underestimate the Green in these 7 districts. My model uses the provincial numbers and then adjust them using regional coefficients (estimated using past results). The model acknowledges that the BC Green party is more likely to increase on the island, but it might still make a mistake. The Mainstreet poll has the Green at 32% on the island, the BC Lib at 32% and the NDP at only 28%. The projections, on the other hand, have the Green at 33% (so pretty spot on), the Liberals at 25% and the NDP at 41%. It thus appears the Green are taking votes away from the NDP much more than what the model would predict. I won't adjust the model just yet and will wait to see if the discrepancy persists (the sample size is really small after all). But if the NDP is indeed as low as 28%, all the ridings where the Green party is projected with more than 5% chances would indeed go this direction (see below for the riding by riding projections). Many will ask whether the Green votes are coming from the Liberals or the NDP. I think the answer is both (plus some people who wouldn't vote otherwise). However, what is very clear is the BC Green can hurt the NDP more in terms of seats. I looked at the correlations between the seat totals of the three parties and got the following numbers. The correlation is 0.28 between the number of seats for the BC Liberals and the Green (this happens because when the BC NDP is low in the simulations, the Green and Liberals win more seats) but -0.48 between the number of seats for the NDP and the Green. Again, it makes sense: when the Green win seats, they do it on the island at the expense of the BC NDP. All that to say that I'm 110% sure John Horgan and the BC NDP will spend the election telling voters not to "waste" their vote for a Green candidate. Expect the issue of vote splitting to be present during the campaign. Overall, the BC NDP is favourite but people should be cautious. First of all, as I was discussing last week, it's pretty certain the actual voting percentages on election night will be different from this poll. Mostly because the BC Conservatives are very unlikely to get 11% of the vote. Mainstreet actually recognizes the issue, mentioning the party only currently has 6 candidates. They tried to reassign the 11% (using the second choices) and that would give us BC Lib at 37%, BC NDP at 41% and BC Green at 22%. I also strongly believe incumbents tend to be underestimated by the polls (while small parties are overestimated) and with 23% of undecided, it could easily make a difference. If we account for the possible overestimation of the BC NDP on the island, and with a possible underestimation of the BC Liberals in the polls (as is commonly the case with the incumbent), this race looks pretty much 50-50. Especially if we remember that a tie would mean Christy Clark would remain Premier (well, unless the BC NDP and Green were to make a deal or something). The chances of a minority government are 10% for the BC Lib and 11% for the BC NDP. At 19%, the BC Green is becoming big enough to actually create the possibility of a minority government. If you are new to this blog, my 10,000 simulations account for the uncertainty of the polls (i.e: margins of error) as well as the distribution/efficiency of this vote. The model uses past results and includes regional adjustments, incumbency effect and other factors. The probabilities at the riding levels have proven to work over multiple elections (including some where the polls were quite off). In particular, the model has yet to make a mistake while calling a candidate at 100% or 0%. Here below are the detailed projections.